The Unsharp Masking technique (USM) originates from traditional lithography. Sharpness impression is increased by contrast rise of small brightness changes. Sharpened pictures appear more detailed, since the human perception is aligned to the recognition of edges and lines. 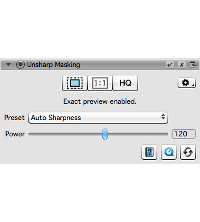 This principle of Unsharp Masking can be transferred to the digital treatment of images. In order to sharpen an image correctly, the resolution which will be used has to be taken into account. Varying scan resolutions require individual sharpening parameters. Sharpening made easy with the new SilverFast 8.8: Initially and before you start sharpening, set your desired resolution. Now open the USM tool dialog and our new Auto Sharpness feature will automatically select sharpness parameters, which have been adjusted to your specific scanner and scan resolution by our SilverFast experts. This procedure applies a basic sharpness to your images. 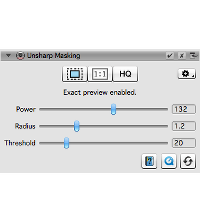 In most cases the sharpness impression will now be considered as sufficiently optimized. If you are not yet satisfied with the sharpening effect, you can also make manual adjustments for fine tuning. How is SilverFast USM working ? Conventional sharpening functions often increase the detail contrast in general and therefore also strengthen any image interference of the original. The image begins to appear very bumpy and unnatural. In contrast, SilverFast USM carefully raises the contrast at edges and lines without loosing any details. The SilverFast scanner software has a sophisticated, automatic sharpening function (adjustable in five steps), which leads to good results for most scans. As a function of the used scanner, output resolution and desired sharpness degree SilverFast USM computes the sharpened image. 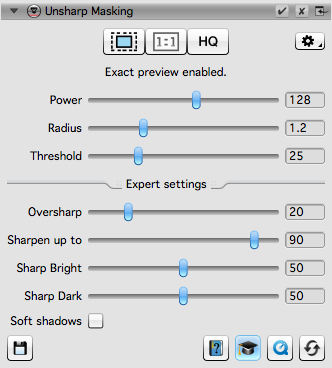 Select a preset for image sharpening from the drop-down menu "Preset". Use the "Power"slider to increase or decrease the sharpening effect, if you are not entirely satisfied with the effect of the USM automatic. Moving the "Power" slider, you can increase or decrease the sharpness effect. The "Radius" slider defines the size of the area around found lines and edges that will be sharpened. The further you move the "Threshold" slider to the right, the smaller are the contrast differences, which are taken into account for sharpening. In addition to the slider controls existing in SilverFast SE Plus 8, there are a number of further configuration options in the Ai Studio Expert settings. 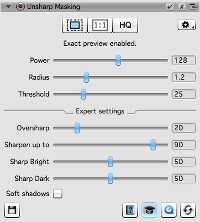 For example, you may setup different sharpening effects for light and dark edges or may soften shadows.